This 8x12 garden shed was built for those looking for an affordable, strong and versatile storage solution. With 622 cubic feet of space, this garden shed has plenty of room to store tools, equipment, lawn mowers and much more. The engineered wood siding acts as a protective barrier against the elements - so you can rest assured knowing all your items will be safe and secure for many years to come. With a little customization, this shed could become the perfect workshop, gardening area, hobby room or home office. 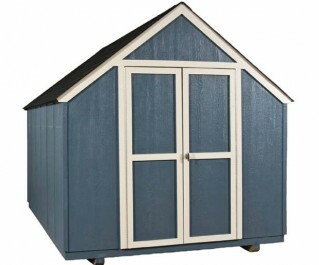 To make your 8x12 shed feel like home, be sure to add a window and flowerbox. Your local building authority may have specific requirements resulting in additional cost. Prices do not include painting, staining, permits, zoning and setback advice and/or compliance, excavation, or leveling beyond 6". All prices and content are subject to change without notice. Promotions are valid with online transactions only and cannot be used in conjunction with promotions at a servicing sales/distribution center or distribution center. Not valid on prior purchases. All stated sizes are nominal dimensions and approximate. Some buildings may be shown with optional items. Additional mileage charges (if applicable) and taxes will be calculated after checkout process is completed. Painted 8 x 12 shed is a representation only, arrives primed for painting in a light beige color. Shed has lasted well and weathered well. Some ventilation would be the only thing I would add. I was extremely disappointed in service I received, I was promised 1 day install, 2 guys came and went 1st day within hours guaranteeing to come the following day regardless of injury. Next day no show, 1 guy comes 2 days later and leaves after almost complete but left materials all over yard then came the next day to complete. Also, I've never received my warranty that was promised. Well made and built. Installed on time. Good price. I searched for days and made the right choice both in quality and most important savings. I really like my shed. It is very attractive and roomy. The worker who put the shed together was very friendly and did not take a long time to put it together. I would recommend this company to others. Learn about our garden shed installation process here.